Our Leader-Manager Development Framework (LMDF) has been developed from the Core Ability Model to provide a simplified and smarter way for us to develop our soft skills, as we progress towards leadership mastery. The starting point for all soft skill development begins with learning about ourselves: our self-efficiency and how our core skills and abilities provide the platform for our progression as a leader-manager. 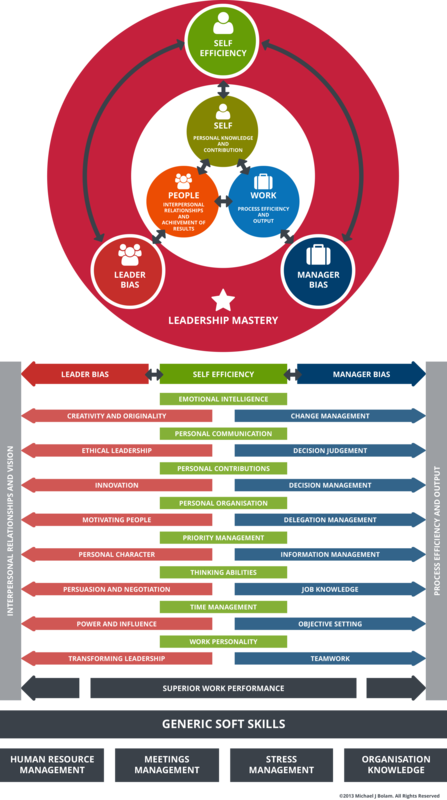 The Leader-Manager Development Framework has, therefore, been designed to clarify those skills that contribute to self-efficiency – those that are biased towards a manager role and those that are biased towards leadership. Collectively, through these skills practised individuals can progress to a position of leadership mastery. Essential to performance at a consistently high level are core skills in self-management. These skills are the key to important behavioural and self-efficiency abilities and unless a strong foundation is built at a very early stage of career development, we will invariably fall short in getting results. Targeting these essential skills ensures that we can improve our self-knowledge and productive efficiency and can build on a strong foundation for leader-manager development. Essential to performance at a consistent high level are our abilities in management. These skills focus on process efficiency in terms of team or group output based on set objectives. Managing involves practising stewardship, directing and being held accountable for resources and responding to the needs of our customers. Managers plan, organise, direct and control teams and groups in achieving product and/or service results, using authority fairly and responsibly. Essential to performance at a consistent high level are our abilities in leadership. With these skills we motivate, influence and change behaviour. Here the emphasis is on inspiring team members, setting the tone and articulating a vision. It requires acting ethically and decisively, as well as putting other people first.